It seems that no matter how big your space is for hosting a Super Bowl party, there&apos;s never enough room, even if you limit the guest list. Your visitors may bring uninvited guests and pretty soon, you don&apos;t have enough seats or places to put down snacks and drinks for everyone. But maybe the problem isn&apos;t the space but what you have in it. Decluttering can help make more room and allow everybody to have a good time. Here are a few tips. Multiple cables snaking their way from your cable box to your screen and to your audio system are not only unsightly but can pose a hazard if someone accidentally pulls on one with careless arm movement or trips over one that&apos;s on the floor. If you don&apos;t have the skills to put your cables behind drywall, hide them with cable tubes or temporary screens. 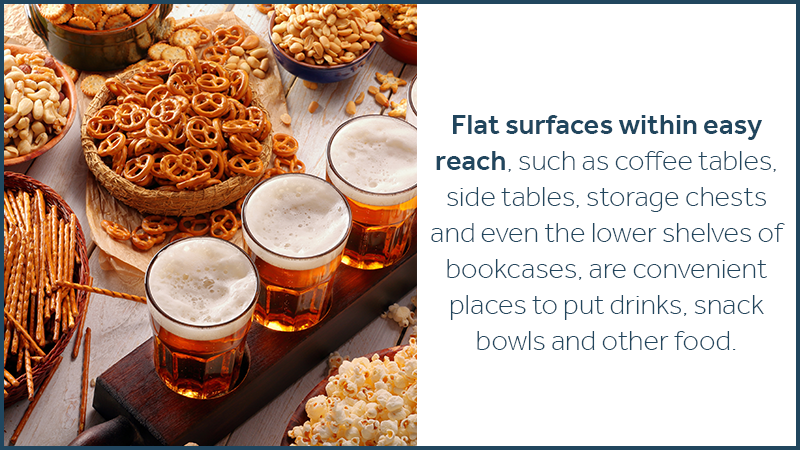 Flat surfaces within easy reach, such as coffee tables, side tables, storage chests and even the lower shelves of bookcases, are convenient places to put drinks, snack bowls and other food. Maximize the available surfaces by removing any items that are already there, such as decorations, books, magazines or toys. You may think that your prized collection of Elvis plates are safe bolted to the wall or that nobody can harm your Royal Doulton figurines on the highest shelves. Yet over-eager fans have been known to wave pennants vigorously or throw things in frustration hard enough to knock things off shelves. If all of your breakables are put away, your guests can&apos;t damage anything. The only furniture that should be in your Super Bowl entertainment space are pieces that people can sit on or use to set down food and drinks. Anything else that just takes up room, such as plant stands, sporting equipment and toys, should be moved out of the space. Removing unnecessary furniture creates more areas for you to put extra chairs and tables. If yours is like most households, your current rooms are probably already filled to the brim with furniture, clothes, accessories and equipment. 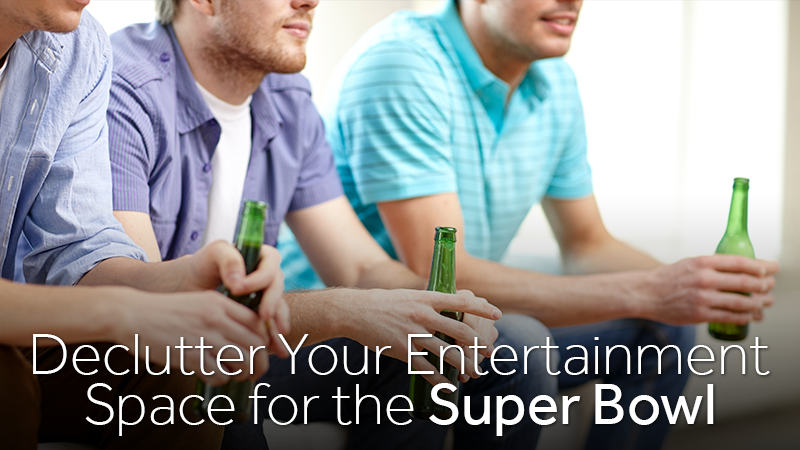 The items you remove from your Super Bowl entertainment area won&apos;t fit anywhere else. An easy solution is to rent portable storage to temporarily hold the clutter you&apos;ve cleared away. We beat competitors prices by 20 percent, so contact us for your storage quote today. You can leave the storage unit in your yard or driveway, or have it moved before game days, so your visitors never see it. After the Super Bowl, you can have it brought back so you can transfer items back into your entertainment space. Of course, you may like the uncluttered space so much that you won&apos;t want to return stuff from the storage system. In that case, you can let us keep the storage unit until you are ready, if ever, to bring it back.